Designing and manufacturing POP displays and store fixtures is both an art and a science. Each custom retail display has a unique set of challenges in both design and manufacturing. With so many design and manufacturing variables, there is a lot that can go wrong. In this blog, we will focus on just 5 examples of mistakes you can avoid by focusing on the details. Mistake #1: If You Want Your Display to Spin, Make Sure You Invest in a Good Bearing. We are frequently asked to design spinning displays. 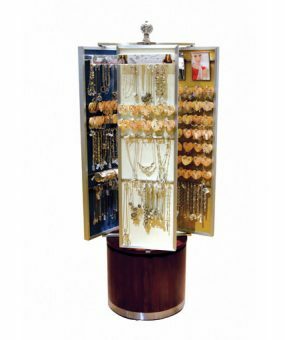 A spinner can be particularly effective in small format stores and in locations in which the display needs to be placed against a wall or in a corner. Similarly, spinning displays often are effective on countertops and display tables. However, like anything with moving parts, a spinning display is more complex than a stationary display, and there’s more that can go wrong. The number one problem we see with spinners is low quality bearings. Low quality bearings often start to bind over time and eventually stop spinning. This problem happens more frequently when the display is heavy, and there is a lot of weight to spin. When a display in a retail store stops spinning, it can be expensive to fix since a replacement bearing requires the display to be dismantled before installing the replacement. Alternatively, the display can be shipped back to the manufacturer for repair, but this option is likely to be even more expensive. The best way to avoid bearing problems is to make sure you invest in a high quality bearing. If you have a chance to test the bearing, make sure you spin the unit many times in both directions to ensure that the bearing does not start to bind. Make sure you test the bearing with the full weight of the display and the merchandise you expect to have on it. There are lots of bearings to choose from, including aluminum, sheet metal and plastic bearings. On your next spinning display, make sure you pay special attention of the bearing so you can avoid potential downstream headaches. Mistake #2: If You Want Your Display to be Mobile, Make Sure the Castors can Support the Weight. Many of our customers want displays that can be easily moved within a retail environment. There can be a lot of advantages to making a store fixture mobile such as making it easy to move during store cleaning or varying the display location to create a new visual experience for shoppers. One of the biggest mistakes we see with castors is failing to anticipate the amount of weight the retail fixture will be required to support. Castors are typically rated for different amounts of weight so paying attention to the weight bearing rating is important. We typically recommend getting a castor that can handle more weight than you think is necessary since we find many POP displays end up holding merchandise that is different than originally anticipated. Castors can not only fail because the castor itself is not strong enough to support the required weight, but the attachment method is also really important. Displays can fail with high quality castors if the wheel is attached in such a way that a single weld is bearing all the weight. When the weld breaks, it doesn’t matter how much weight the castor can bear. It’s also important to keep in mind that there is more stress placed on the castor and the welds when the display is being moved since the weight load is dynamic rather than static. Heavy-duty castors can also help protect retail fixtures from damage when children or store personnel climb on or lean on the fixture with their body weight. There are a number of hardware options for attaching parts when making knock-down wood displays. Two of the most common attachment methods are wedge-fits and cam locks. Depending on the display, both can be effective. The advantage of wedge-fits is they do not require any tools during assembly, whereas cam locks require an Allen wrench to tighten into place. Some of our customers are insistent on using wedge-fits because they do not want the assembly of the display to require tools. In many cases, wedge-fits are perfectly appropriate. However, using wedge-fits can turn out to be a big mistake if the retailer is inclined to move the display around. The risk is particularly high when store personnel attempt to pull the display by its shelves or if a shelf using wedge-fits is hit with force from underneath the shelf. In general, cam locks can reduce the risk on knock-down wooden displays. It is understandable that the majority of focus in creating most merchandising programs goes toward point-of-purchase design and manufacturing. Frequently there is not enough attention paid to packing of displays. A beautifully design display can fail if the packing is inadequate. It is always important to understand upfront how the display will be shipped. If the display will be shipped to distribution centers on pallets, it may require less robust packing than displays that will be drop shipped via UPS or FEDEX. It is also important to consider the type of material used to build the display. An acrylic display that has multiple glue joints and will be drop shipped via UPS will require sophisticated packing that could cost 20%-30% as much as the display itself. For a display like this, using 1” hard foam of all six sides of the box probably will not be enough protection. Thicker soft foam that can absorb shock is likely to be required along with a honeycomb or hard material outer box. Packing requirements may be different for wood or metal displays. Our suggestion is to involve packing experts on any displays that might be considered fragile. To be safe, it is also advisable to get your UPS or FEDEX rep to sign off on the packaging to ensure that you will be eligible for reimbursement in the event of damage. In many cases, there can be substantial savings in shipping fixtures knock-down to retail locations. In the majority of cases, our customers rely on store personnel to assemble the fixtures. It is important that the assembly process be carefully thought through prior to finalizing the design. Be sure that the fixture can be assembled in a reasonable amount of time (generally not more than 20-30 minutes). Make sure there are easy-to-follow assembly instructions that are numbered. Whenever possible include pictures of the parts and assembly steps. It’s best also to include all of the tools that will be required for assembly. In some cases it can help to create a Youtube assembly video since most store personnel have smart phones and often prefer to watch a video rather than read instructions. In fact, in many cases we find that store personnel won’t bother reading the instructions provided. It is a good idea to try assembling the fixture yourself beforehand so you clearly understand the potential problem areas during assembly. And, try to clearly label all parts, particularly if you have different sizes of screws or other similar parts. Partially assembling fixtures is also a good idea when possible. The bottom line is to keep things simple and make it as easy as possible for someone who is unfamiliar with your fixture to assemble it in a matter of minutes.